William Halsey was the most famous naval officer of World War II. His fearlessness in carrier raids against Japan, his steely resolve at Guadalcanal, and his impulsive blunder at the Battle of Leyte Gulf made him the 'Patton of the Pacific' and solidified his reputation as a decisive, aggressive fighter prone to impetuous errors of judgment in the heat of battle. 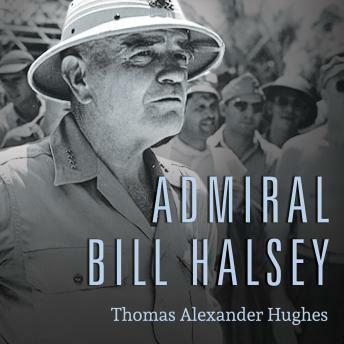 In this definitive biography, Thomas Hughes punctures the popular caricature of the 'fighting admiral' to reveal the truth of Halsey's personal and professional life as it was lived in times of war and peace. Halsey, the son of a Navy officer whose alcoholism scuttled a promising career, committed himself wholeheartedly to naval life at an early age. An audacious and inspiring commander to his men, he met the operational challenges of the battle at sea against Japan with dramatically effective carrier strikes early in the war. Yet his greatest contribution to the Allied victory was as commander of the combined sea, air, and land forces in the South Pacific. Skillfully mediating the constant strategy disputes between the Army and the Navy, Halsey was the linchpin of America's Pacific war effort when its outcome was far from certain.